Library image #31: Snow hiker on side of mountain. The United States Congress designated the Inyo Mountains Wilderness (map) in 1994 and it now has a total of 199,208 acres. All of this wilderness is located in California and is managed by the Bureau of Land Management and the Forest Service. The Inyo Mountains Wilderness is bordered by the Death Valley Wilderness to the east. The north-south Inyo Mountains comprise a high and vast desert range, and the isolated and pristine Wilderness that bears their name encompasses a large portion of this sheerly rugged terrain. The area reaches a high point on Keynot Peak, at about 11,000 feet, and separates the Owens Valley on the west from the Saline Valley on the east. Most of the eastern border is shared with Death Valley National Park. Year-round streams, some cascading over waterfalls, can be found in eight canyons on the rough east side. These steep-walled canyons offer challenges to rock climbers. In addition to Keynot Peak, the prominent summits of New York Butte and Mount Inyo provide tough, nontechnical hikes with splendid views as rewards. Creosote, shadscale scrub, and sagebrush proliferate at lower elevations. You'll find a lush riparian habitat in the moist canyons, and pinion-juniper woodlands on some of the slopes. Bristlecone and limber pine grow in the higher reaches. 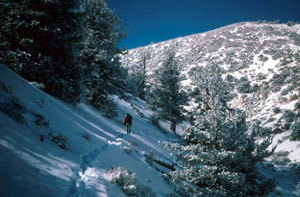 Inyo Mountains Wilderness lies partly on BLM land and partly within Inyo National Forest. A rich mining legacy has left a smattering of ruins to explore, and the towers that supported a men-and-salt-bearing tram from the Saline Valley salt mines to Owens Lake can still be seen on Cerro Gordo Peak. There are 103 miles of unmaintained trails, often difficult to follow, a holdover from historic use. Most of these trails are not shown on maps. From Reward, the old Lonesome Miner Trail (40 miles) will take you south through the highest country to Hunter Canyon. The chance for a solitude-rich Wilderness experience of a high order awaits the adventurous. Planning to Visit the Inyo Mountains Wilderness? How to follow the seven standard Leave No Trace principles differs in different parts of the country (desert vs. Rocky Mountains). Click on any of the principles listed below to learn more about how they apply in the Inyo Mountains Wilderness.